The Savannah is hot and the animals are really thirsty. Really thirsty! So the race is on to the Savannah Cafe for some refreshing drinks. Who will be first ? Will the winner be the fast but always hungry gazelel, the lazy lion with the dangerous fangs, or the slow hippo with the frightening roar ? Using some special cards that they can steal from their opponents, a little luck and a few sneaky tricks, players must get the last drink from the cafe before it closes for the season. A fast card-based game with beautiful graphics. 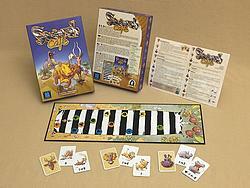 Each player manages 3 animals: a lion, a gazelle and an hippopotamus. The goal is to move one animal so that it reaches the bar at the top of the board. To to this, players must wisely use their action cards. The lion can eat a gazelle, the hippopotamus can make the lion go back, and the gazelle can jump very far, but not very often. A player can steal another player cards during the game, or spend one of his cards.